What's going on with Jeff Evans and the world of MountainVision... Here you will find my own personal diatribe regarding thoughts and stories I encounter in the world of adventure travel, climbing and mountaineering...infused with the themes that are the cornerstone of my MountainVision message...Teamwork, Vision, Commitment and Leadership. Tough to know where to begin. I'll start with stating this has been potentially the most intense week of my life. And those that know me understand the magnitude of that statement. I can provide the synopsis here. It will take months to process and effectively document the experience and all that came with it. As I commented at the beginning of the week, we moved up towards the front line as the Iraqi Special Forces continued to push ISIL back. We were told we would be as close as possible to the fighting but still have at least a 2km buffer. Although this is short of organizational policy of 5km, our team unanimously agreed to accept the implied danger. For reference, US military trauma units are mandated to be 15km from front line conflict. We settled into our house and established our trauma bay across the street in a garage bay. The mortars and small arms fire were now over our heads and the house and ground would regularly shake with the larger explosions. Not 10 minutes would pass without gunfire or explosions. 24 hours a day. 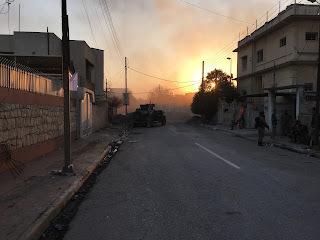 We were surrounded by Iraqi special forces with humvees blocking each entrance to the road in front of our house/clinic. The neighborhood was mostly evacuated. The General of the ERB group posted up on our same block. We felt vulnerable but relatively safe. The volume of critical patients was steady. We treated dozens. Most were salvageable. Occasionally we took cover in a subterranean reinforced basement as debris rained down on our tin roof. The exodus of displaced locals began. 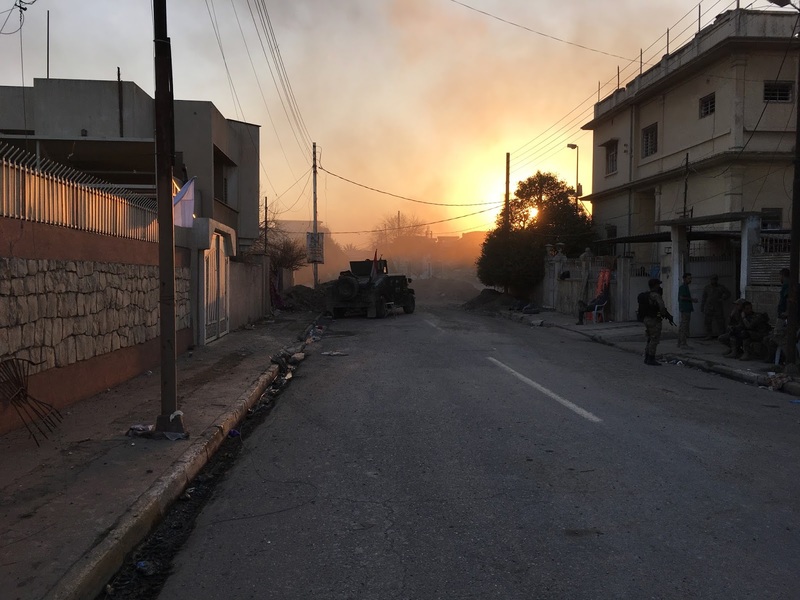 Thousands of Iraqi civilians began filing down the street just 100 meters away from our clinic. Many of them needing care but all posing a security threat to us and our location. The security team did their best screening critical civilians and sending the rest down the road to some unknown location. The tension level went up as civilians were delivered to our trauma bay on wooden carts and broken wheelchairs. Right out of the gate we lost a civilian little girl... the absolute barbarism shook us all up. Then we got a save on a civilian with extreme mortal injuries. Without providing details, he was hanging on... and out. But we stabilized him, packaged him and he will live. The front line began to pulse back towards us. A mortar landed in the yard next to us which we would later come to find out was a locator. Someone, we are unable to confirm who... most likely a civilian passing by or glassing us from close by, passed our location on to ISIL and they began targeting us directly. The mortars started dropping in... each one closer. They had a bead on us and would have loved nothing more than to take out a group of Americans caring for their enemy. The big one hit on the sidewalk just outside the gate to our house. One of our paramedics caught a piece of debris in the back of the leg. We took cover. 30 seconds later our security team carried in the soldier that was posted in front of our gate. He was lifeless. Our team moved quickly on to him as heavy fire rained around. We decompressed his chest, threw lines in him and I placed a chest tube, which immediately improved his situation. Two of our medics loaded him into the ambulance with blown out windows and screamed out of our location to a military OR. We all retreated to the basement and held tight as the mortars landed in our yard. 2 hours later we evacuated in the blown out ambulances and returned to our first location well out of mortar range. We built a little fire in the yard and sunk down as the adrenaline oozed away. Prior to finally laying down around 11pm we set up 3 beds and our trauma rolls... thankfully. We were awakened at 3:30 this morning. A massive IED had gone off a couple miles from our forward house. Eight ERB soldiers were killed. We began receiving ambulances in succession. Several amputations and shrapnel wounds. All will live. I tried to go back to sleep a couple hours ago but it's useless. Tough to slow down the mind at this point. We will re establish our trauma bay at a new location tomorrow. Further back. The new team arrives Sunday. We will set them up for success. I go home on Monday. And I will rest. I am honored to have served with this team. So talented and committed. An absolute privilege. Hug your loved ones. Be compassionate. Be generous. The world needs more of that. Addendum.... just got word they caught the local guy that was calling in the mortar strikes to ISIS. Dude lived 3 houses down from our house and was releasing pigeons to alert the ISIS mortars to our exact position. He is in custody now in our former side yard. I saw a photo of him. He has a bag over his head. I am told he will be dealt with accordingly. That makes me happy.